There are perhaps six of these rarities around, all in marigold. Here are the two treatments known, round and flared, and ruffled. Also shown are the two dancing figures that appear on opposing sides–slightly different. Fenton used the mold to make a wide variety of non-Carnival shapes as well. 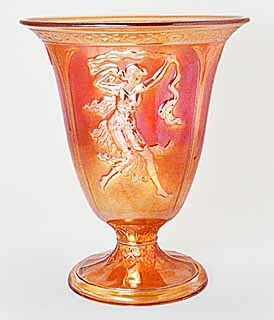 Not exactly the same pattern as the Dance of the Veils vases, but it incorporates the same images of the dancing ladies. 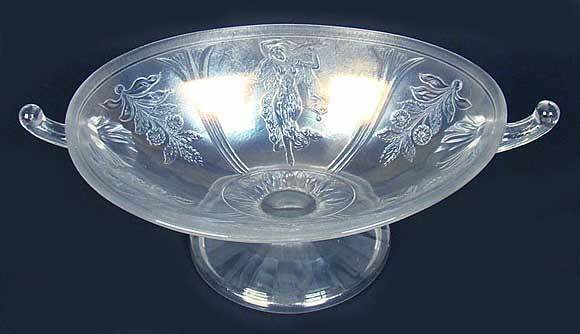 The pattern dates from Fenton's 1930s production. This 9 1/4 inch long bowl was listed as the only one known at the 2009 auction where it sold for $2,200. 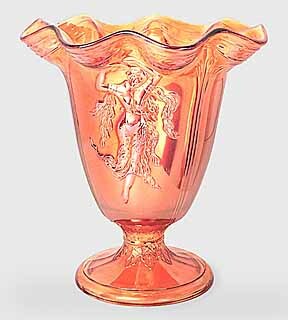 The color was listed as Persian Pearl and dates from Fenton's mid-1930s production.